We will be pruning our raspberries and cleaning up our strawberry patch to help this summer’s fruit harvest. You must wear long sleeves, long pants and closed shoes (e.g. rubber boots, running shoes) for this work. Baseball caps are also helpful. If you have gardening gloves, please bring them along otherwise we will provide. We will provide the tools. This project will not be suitable for children but we have other activities such as raking leaves that might interest them, if supervised by parents. We will be digging up some new beds and doing general cleanup of large weeds. Please wear rubber boots or closed shoes such as running shoes. If you have heavier gardening gloves please bring them along, otherwise we will provide. We will provide all tools. This activity is best suited for ages 12 yrs+. 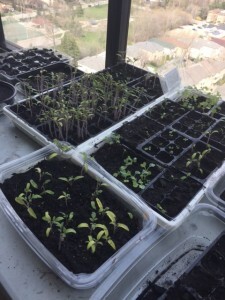 We will be planting our seeds and seedlings over the course of several Saturdays, starting with our cool weather crops such as peas and spinach, and ending with our warm weather crops such as peppers. Ideal activity for new and returning volunteers and also for families with children 4 yrs+. If it is warm out, please bring some drinking water. Our regular work shifts begin in June.